Even after a year on Twitter I still find the connections you make amazing and surreal at the same time. I guess its true of any kind of networking that if you put effort in and talk to people then you’ll have some great opportunities present themselves. I’ve meet a whole lot of fascinating people, some I’ve only talked to on Twitter so far but plenty I’ve met in the ‘real’ world as well. So I’ll be carrying on tweeting (and other online networking) and hoping to meet more. I kind of hope he wouldn’t have dumped me but it did spur me into action, well at least to writing the blog and then other things unfolded from there. I have to say that writing for others wasn’t particularly on my list of places it might take me, so it was nice to have someone think my writing was what they needed for their newsletter that goes to 6000 people every two weeks. I’m sharing the writing with Helen from A Forkful of Spaghetti, we’ll be trying to alternate each newsletter so that the readers get a different outlook. 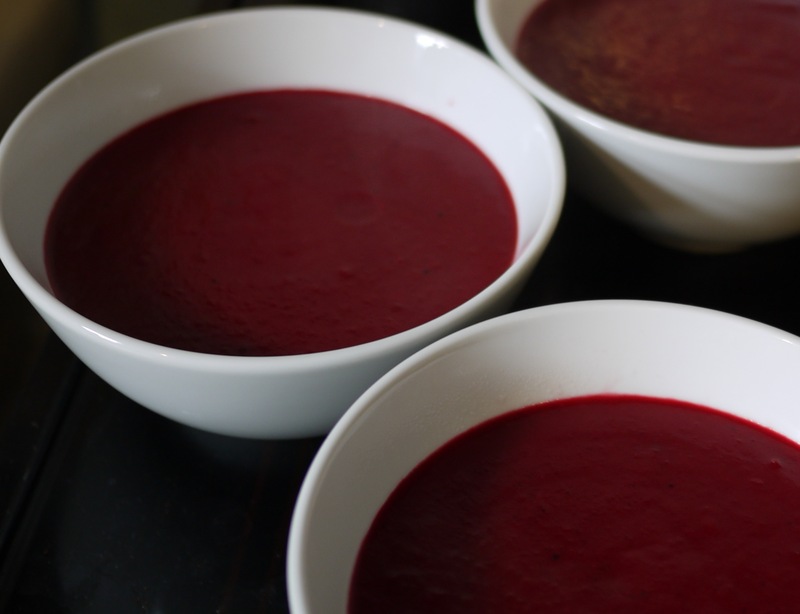 We’ll be talking about what’s in season and trying to highlight the best of local British produce, things very dear to my heart when it comes to food. So without further ado I’d like to say a big big shout for Francoise Murat for asking me to contribute to her company’s newsletters. Its very nice to see my writing sitting alongside articles about garden and interior design, two things I love but rarely touch on here, after all this is all about the food. I’ll post each piece on the blog close to when it goes out but if you like gardens and interiors then you should at the very least take a look at Francoise’s website and follow her on Twitter. “Here, turn right here, this has got to be it”. We swerve round the corner and bounce along the driveway. “Nice pond, but where’s the big house?” There’s plenty of rolling parkland and a cluster of outbuildings but no grand house to be seen. 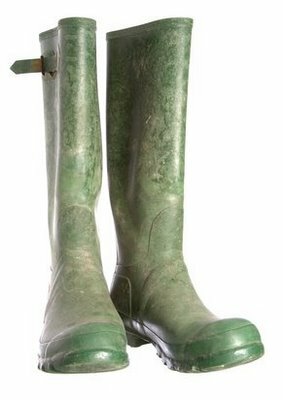 There’s also a tall affable looking chap wearing wellies and a big chunky jumper so we slow up and roll down the window. “Here for the food foraging?” he says, “follow the track round between these buildings and you’ll see a group of parked cars and over to the right people on the lawn, that’s were you need to be.” So we drive on as instructed and sure enough there’s about 15 cars and a bunch of people standing about having coffee. I get out and amble over and my husband drives off to a day of peace and quiet. At last, I’m at Food Safari’s first foraging event at Henham Park in the depths of rural Suffolk. I get a coffee and Polly (half of the duo that makes up Food Safari) passes me some still warm flapjack (yum! this is a good way to start) then introduces me to the rest of the group – none of whom I’ve met before but some of whom I’ve been chatting to via twitter (yes that’s you @Farctum and @EssexGourmet). Once everyone is here Tim (the tall affable chap in wellies, he’s the other half of Food Safari) tells us the format of the day. 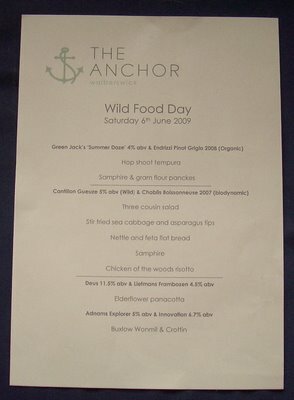 We’re going to be foraging for wild foods here on the estate and then also down by the river Blyth (also on estate land) then we’ll be off to The Anchor at Walberswick for a lunch show-casing some of the wild foods. Tim hands over to Jacky (aka WildFoodie) who’s our foraging expert today. She explains that we are on private land so sadly we can’t entertain any thoughts of popping back sometime to bag some more goodies; well I guess not unless we can get to be new best friends with Hektor who manages the estate, I imagine he’s probably got enough friends already though. Jacky also explains that the weather in Suffolk has been so dry recently that we probably aren’t going to find enough stuff in really good condition for us to take bagfuls home. We are going to have to be content to watch and learn, that’s the nature of foraging, it’s a real luck of the draw thing. Jacky had a scout about yesterday so she’s got lots of examples to show us and she’s been able to collect enough goodies for our meal later. Then we move on to our first spot, I’m expecting we’re going to have to walk a good distance across the park perhaps into a wooded area, but no, there’s plenty to see only steps away from where we are. Take a look – what can you see that’s edible? 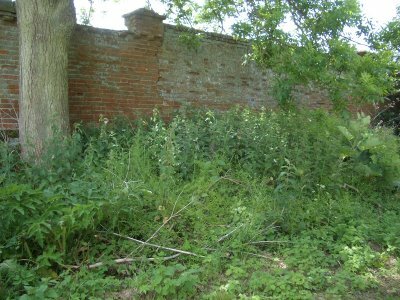 Hmmm looks like a bunch of weeds in a badly tended garden if you ask me…..but hold one we are going to find at least FOUR, yes that’s four, edible goodies in this patch. Okay so clearly I’m in nappies on the foraging front compared to the likes of Jacky – I can’t see a thing I’d fancy eating. But with Jacky’s expert guidance we learn about ground ivy, cleavers (aka sticky willy – hmmm), nettles, ground elder, burdock and elderflower – blimey that’s six – and I don’t think Jacky was even trying hard….she tells use how to identify each of them through look, feel and even sound and also which bits to pick and even how to pick (clever scissor movement with your fingers for nettle tops). We taste as we go when things are okay to eat raw. Mostly everything we test has a fresh but quite bitter taste but there are differences between them. Next its time to move on to the river. But before that a few of us think a comfort stop might be good so Polly takes us over to the stable block, which has been converted into a rather lovely looking B&B, and we get to use the facilities there. I also get a quick lesson in the intricacies and long running feuds of the Rous family and learn that the final version of the big grand house was knocked down (some say a fortuitous fire…) in 1953, so that’s why we couldn’t see it. There are plans afoot for a new house to be built. Anyway down to the river – I would say bank but here the estuary is really wide and flat so it’s more like a gentle slope. 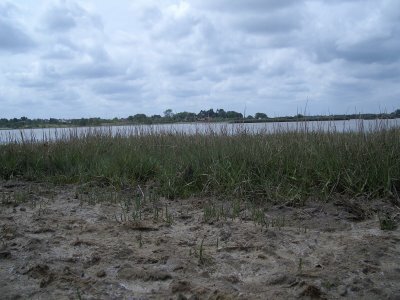 The estuary systems in Suffolk and Norfolk are havens for all sorts of things and in particular marsh samphire. I’ve had this before, bought from local farm shops and I love it. We are a little early in the season but we can see the samphire starting to sprout like some kind of mini primeval forest. We get to test the samphire and its wonderfully juicy with a salty tang –I’m looking forward to it being available in the farm shop soon and hoping we get some at lunch. 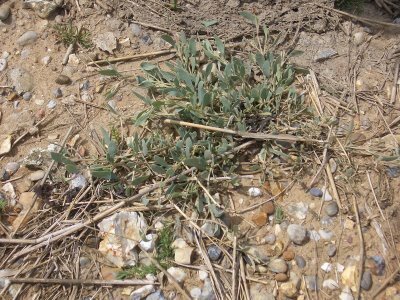 We also find sea purslane which looks a bit like a succulent version of sage although it tastes nothing like sage. Again it’s juicy and salty. And finally we head off to The Anchor pub at Walberswick with our appetites suitable whetted. But before we get to tuck into lunch we take a quick look at the pub’s allotment where Jacky tells us about poppy leaves (nice and sweet and almost pea like in flavour), hops shoots, dead nettles and chickweed (plus other assorted things you might just throw away but can actually eat!). At last it really is time for food. We wander over to the beautifully refurbished stable block and are served with glasses of refreshing elderflower scented beer from Lowestoft whilst nibbling on fresh asparagus, tempura hop shoots and absolutely wonderful chickpea and samphire mini pancakes. These are so divine we are nearly knocking each other out of the way to get our hands on them; I’m definitely going to be trying to recreate them at home. and finally my favourite local cheese, Buxlow Wonmil. It makes a change to have lovely food paired with beers rather than wines and is something I might try myself. Of the beers I think my favourite was the Frambozen although the Gueuze was much nicer than Mark’s description would lead you to expect; its kind of nicely tangy and refreshing, a bit like liquid sourdough. Its time for everyone to head their separate ways, full of new knowledge, exceptional food and plenty of beers. I have a glass of Benedictine for the road (fortunately my husband is collecting me) and we waddle off clutching our information packs, happy foragers that we now are. 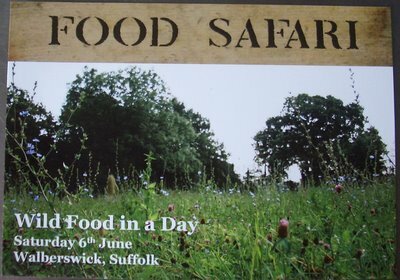 You can find out more about Food Safari’s days out in Suffolk on their website, arrange gift vouchers for loved ones or simply book a treat for yourself. I’m hoping to try another one of their days soon. 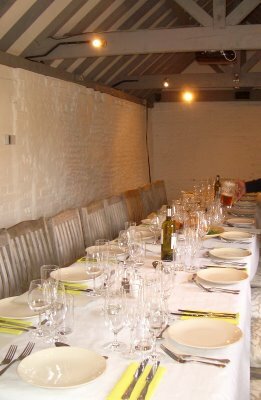 To view the menu and other information about The Anchor at Walberswick click here. Go on treat yourself to some great food and beer. Err, hello, um, what’s all this #livelocal thing??? I’d seen a bit of twittering about this (hence the # tag – used in twitter to make searching easier) and wondered what it was so I headed over to Becca’s blog to find out more. Here I saw that Becca was about to spend the next 7 days (she’s started today I think) trying to only eat foods that had been grown with 100 mile radius of where she lives in Sydney, Australia. Interesting challenge I thought and then also spotted that it was a wider initiative to get people to undertake projects and habit changes that were locally focused,such as cycling to work. Hmmm wonder if I can join in and what I could do. A few tweets later and I’m signed up at LiveLocal as the first UK participant (woo hoo I’m a global first – yes quite!). Then to thinking about a plan. I like Becca’s local eating idea and I already try to buy local food but its pretty easy to realise that you can do much more and that also you might have to make some sacrifices along the way. my cupboards and freezer are stuffed full of things that have been lurking for sometime, so first part of the challenge is to start munching through these. I’ve already probably burnt a giant carbon footprint acquiring them so I really should get on with making use of them. dried and frozen foods aren’t going to cut it for a whole week though are they so anything extra I need has to either come from my herb garden or be sourced from an area bounded by the Thames to the south, the east coast of England, a line up from the western edge of the M25 and a line cutting across from Norwich. I’m guessing this about the same area as 100 mile circle (or less) but seems to make more sense as to the direction I should look for food stuff. I’m only to walk, cycle or take the Tube/bus to the shops but I can incorporate shopping into an existing car trip. I’m going to think about everything I eat or drink and wonder about its provenance and whether I can change how I buy it. I know right now I’m not going to give up coffee so am I buying the most ethical I can and I am supporting a local roasters. It seems easy on the face of it but I think it’s going to be quite hard, but I’m enjoying thinking about how to be more local in my choices. I’ll be blogging about how I’m getting on so come back to find out more. Wish me luck! b. its Monday so time is short for food shopping. I got what I needed – a good bunch of asparagus (it was from Hampshire – I’m really wondering where the East Anglia asparagus is this year after all its nearer – so much for Waitrose’s local sourcing policy!) and a small bag of Jersey Royals (and what happened to them being sold still in the soil it seemed so much better and they had them like that last year?). Anyway back home with my haul of goodies I set to work to make a quick lunch. 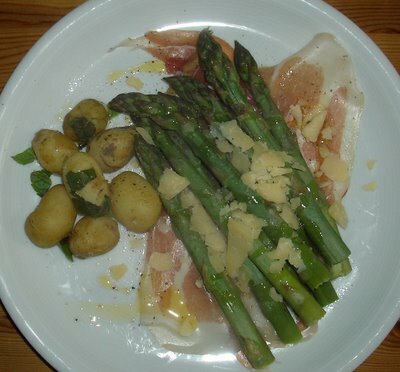 I like my asparagus simply done –I’m not one for turning it into soups it always seems best to me steamed or maybe grilled and then dressed with some oil or butter, or served with simple accompaniments such as poached egg, or a little cheese. Today I opted for steaming it above the potatoes and then serving it on a bed of parma ham, drizzling it with olive oil and sprinkling with a little bit of Sacanova Aged Mahon cheese, the potatoes were alongside with some oil and fresh mint. Sweet and slightly nutty asparagus, earthy, nutty potatoes, sweet ham and a salty caramel tang from the cheese – perfection. With only about 45 days left to get my fill how shall I have tomorrow’s asparagus? Last night I had mussels just as they should be – wonderfully fresh, plump, sweet and with a tang of salty sea-ness about them. 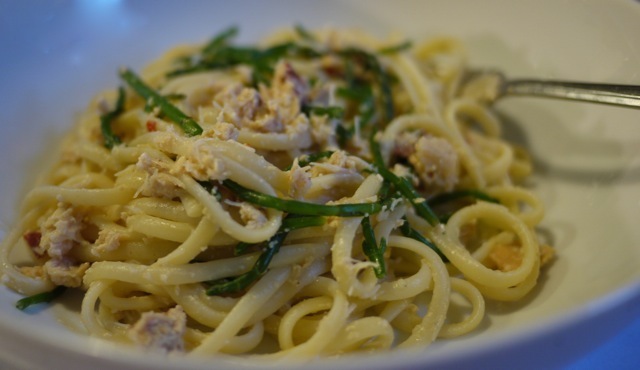 Cooked in the classic style of mariniere – butter, white wine, shallots, parsley and served with crusty bread to mop all the delicious juices. 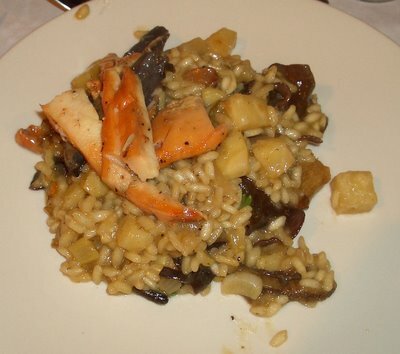 I have to confess I didn’t cook them myself – I’ve always been a bit scared about preparing shellfish at home, maybe I just need to find a reliable local source and give it a go. The instructions in books always seems a bit of a faff – lots of leaving the shellfish in a bucket of water for days (! ), swooshing them round to get out any grit, tapping them too see if they are dead or alive (and I don’t mean the 80s band from Liverpool), scrubbing, scraping etc etc, all before you get to cook them for about 5 minutes. I like the hard work to be done by someone else sometimes and I just do the eating. So these were my starter at Regatta in Aldeburgh (after a bracing walk and a quick pint of Adnams). I followed them with salt beef, home made piccalilli (homemade by the team at Regatta not by me!) and new potatoes. But the mussels had been so lovely and such a generous portion (the amount some places would give you as a main to be honest) that I stalled part way through the salt beef – and now I’ve got a little take out to make a sandwich with for lunch tomorrow ?. I’d say these were the best mussels I’ve had by far ever and I’ve eaten a fair few in my time. Just goes to show how good local produce (there’s plenty of mussels produced on the Essex and Suffolk coast) fast from the producer to the table can be. So good I might even venture to cook some myself this season. No pictures sorry, was too busy eating!